Our veterinarians offer a very thorough approach to diagnosing the lame or poor performing horse. We offer high quality digital imaging radiographs. 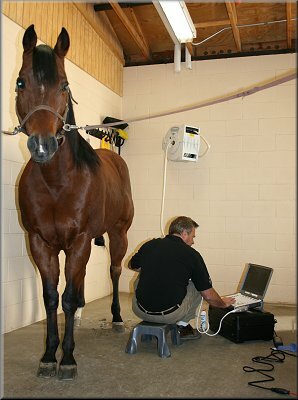 We perform ultrasounds regularly and incorporate an intensive schedule for rehabilitation, offer Vet Stem therapeutic injections for tendon/ligament injuries and perform comprehensive reevaluations as the horse progresses. Surgical therapies are also considered as needed. Our hospital offers both a hard and soft area for evaluations as well as hills and an arena is adjacent. IRAP - (Interleukin receptor antagonist protein) is a treatment for joint disease to decrease pain and inflammation associated with conditions like arthritis. The procedure consists of obtaining a blood sample and then centrifuging, incubating, and freezing the serum that is rich in IRAP. Several treatments can be derived from one IRAP process and the individual serum treatments can be injected directly back into the affected joints. Typically, 3-4 injections are obtained from each processing and are then administered 1-2 weeks apart. PRP - (Platelet rich plasma) is an innovative technique that uses the bodies own growth factors to enhance healing and accelerate skin and soft tissue regeneration after injury has occurred. It is also being used as a healing application in tendon or ligament injuries. While still in the early stages of research, it appears to decrease the healing time, improve the quality of repair, and allow the horse to return to performance with a decreased incidence of re-injury. To administer PRP, blood is collected from the horse and processed to concentrate the platelets. The platelet rich suspension is then injected back into the damaged tissue. Overall, the PRP is shown to dramatically enhance tissue recovery. Stem cell therapy utilizes the latest advances in regenerative medicine by harvesting the patient's own fat derived stem cells and injecting them directly into the area that requires treatment. Those cells then develop into new cells of the surrounding tissue type and help in the repair. Stem cells are used because of their inherent ability to adapt in their new surroundings and become like the tissue they are placed into. The conditions we use stem cells to treat are tendonitis, ligament injuries, osteoarthritis, and meniscal injuries. The procedure involves removing a small amount of fat from the rump of the patient. The fat is then shipped to a company that harvests and grows the stem cells for use, and then packages them in an easily injectable manner. The cells are then injected into the affected area of the horse 48 hours after the initial harvest.